If you're out and about this weekend, be sure to stop by your local Target. 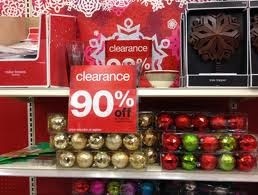 We're hearing that many Target stores have marked their Christmas Clearance to 90%. When I was at our local store, there were still lots of items left. Stock up now for next year. Its hard to beat some of these awesome prices & deals!